The awards presentation was held on Saturday, June 17, during the “Saddle Up For Scottsdale”, a jammed-packed equine media educational and networking conference held in Scottsdale, Arizona, on June 15-17, 2017. AHP members came from all over the United States and Canada to applaud this year’s winners and enjoy a final night with friends, old and new. A reception co-sponsored by Freedom Health LLC and Lumina Media, publishers of Horse Illustrated, Young Rider and HorseChannel.com, preceded the Awards Banquet sponsored by Zoetis. Breyer Animal Creations provided their Bandera model horse as centerpieces which one lucky attendee at each table took home. The General Excellence Award is a coveted honor for print publications and this year’s recipients included NRHA Reiner in Association Publication circulation under 15,000, USDF Connection in Association Publication circulation 15,000 and over, Quarter Horse News in Self-Supported Publication circulation under 15,000, and Western Horseman in Self-Supported Publication circulation 15,000 and over. All winners in the four General Excellence classes were eligible for the Overall Publication Award selected by a separate judge. The prestigious award was presented to Western Horseman, a monthly magazine for Western stock-horse enthusiasts for over 80 years. The Equine Media Awards offer two divisions. The Publishing Media Division is for Publishing Media and Individual members. Publishing Media members that achieved multiple honors in a variety of print and online categories included: Western Horseman with 15 awards; Mid-Atlantic Thoroughbred with 11 awards; Paint Horse Journal with 8 awards; Chrome and Quarter Horse News with 7 awards each; The American Quarter Horse Journal and The Chronicle of the Horse with 6 awards each; Thoroughbred Daily News with 5 awards; and American Cowboy, America’s Horse, BloodHorse, Equine Journal, EQUUS, and Modern Arabian Horse (now Arabian Horse Life) with 4 awards each; Daily Racing Form, NRHA Reiner, Practical Horseman, The Horse: Your Guide to Equine Health Care, and The Chronicle of the Horse Untacked with 3 awards each; California Horsetrader, Horse & Rider, Horse Illustrated, New York Horse, Ranch Horse Journal, Sidelines Magazine, Speedhorse, USDF Connection, and Western Horse & Gun with 2 awards each. Publishing Media members with one or more first place awards included: American Cowboy, America’s Horse, BloodHorse, California Horsetrader, Chrome, Equine Career Network, Equine Journal, Horse & Rider, Horse Radio Network, Mid-Atlantic Thoroughbred, Modern Arabian Horse, New York Horse, NRHA Reiner, Paint Horse Journal, PleasureHorse.com, Practical Horseman, Quarter Horse News, Sidelines Magazine, The American Quarter Horse Journal, The Chronicle of the Horse, The Horse: Your Guide to Equine Health Care, Thoroughbred Daily News, The Chronicle of the Horse Untacked, USDF Connection, Western Horse & Gun and Western Horseman. Other Publishing Media members that earned EMA honors included American Racehorse, Barrel Horse News, Cowgirl Magazine, Dressage Today, Driving Digest, Hoof Beats, Off-Track Thoroughbred, PATH Int’l. Strides, Pennsylvania Equestrian, The Florida Horse, and USHJA In Stride. Fourteen freelance journalists and photographers who are AHP Individual members, received top honors for material they entered in the competition. Among the multiple award winners were: Kate Bradley Byars, Bianca McCarty, Katie Navarra, Cheri Prill, and Kelly Sanchez. Individual members with first place awards included Jennifer M. Keeler in Horse Care Single Article circulation 20,000 and over, Bianca McCarty in Equine-related Freelance Website; Merri Melde in Equine-related Book; Cheri Prill in Editorial Action Photograph and Freelance Editorial Photograph, and Kelly Sanchez in Equine-related Mainstream Journalism Article and Freelance Writer Equine-related Journalism. Other Individual members who earned an EMA honor were Megan Arszman, Abigail Boatwright, Melinda Brown, Sarah Evers Conrad, Dusty Perin, Kara Stewart, and Scott Trees. Among the AHP freelance members whose work was entered by an AHP Publishing Media member and won or placed were Megan Arszman, Jennifer Bryant, Sarah Evers Conrad, Doris Degner-Foster, Delores Kuhlwein, Tracy Gantz, Marsha Hayes, Douglas Lees, Jennifer M. Miller, L. A. Pomeroy, Kelly Sanchez, Milton C. Toby, and Linda Yutzy. AHP Business members entered their work from 2016 in the Business Division. Multiple award winners included Central Garden & Pet with 7 awards for their equine brands, Farnam, Horse Health Products, and VitaFlex; Manna Pro Products with 5 awards; Purina Animal Nutrition and SmartPak with 3 awards each; and American Paint Horse Association and Road to the Horse with 2 awards each. Earning first place awards in the Business division were American Paint Horse Association in Business Brand Content Marketing Single Article; Boehringer Ingelheim in Business Equine-related Brand Multimedia Ad Campaign; Central Garden & Pet in Business Equine-related Print Ad Campaign and Business Equine-related eNewsletter; Manna Pro Products in Business Equine-related Single Print Advertisement, Business Equine-related Single Online Advertisement, Business Brand Equine-related Blog, and Business Brand Equine-related Website; Purina Animal Nutrition in Equine-related Newsworthy Video and Equine-related Brand Marketing Video; Road to the Horse in Business Brand Equine-related Custom Publication. Other Business members that earned an EMA honor included Certified Horsemanship Association, Horse Lifestyle, Horseware Products, Monty Roberts Join Up International, National Reining Horse Association, Ohio Quarter Horse Association, Pinto Horse Association of America, and PM Advertising. 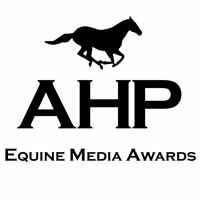 Held since 1974, the AHP Equine Media Awards provides members with an opportunity to be recognized for excellence in equine publishing, print and online, as well as professional critiques for improvement. Award winners may request images from the presentations by contacting Diana De Rosa at dderosa1@optonline.net. AHP congratulates the members who achieved excellence in equine publishing and encourages all members to strive for excellence in journalism for the horse industry. Rules for the 2018 Annual Awards Contest for material published in and dated 2017 will be available to members in early January. American Horse Publications has united equine-related publishing media, businesses, professionals, colleges, and students for nearly 50 years. The non-profit professional association promotes excellence in equine publishing media and encourages relationships and communication to increase interest in the horse industry. For further information on the awards competition or member benefits, contact: Chris Brune, American Horse Publications, ahorsepubs@aol.com or visit the AHP web site at www.americanhorsepubs.org.